"I made this recipe up when I was 13, and I've been perfecting it ever since. The pie uses plenty of fresh raspberries and blueberries, and is baked with a crumb topping." Mix apples, raspberries and blueberries; pour into pie shell. In a large bowl, combine flour, brown sugar, butter or margarine, cinnamon, allspice and nutmeg. Mix until dry and crumbly. Sprinkle over fruit. Bake for 30 minutes, or until topping is brown. 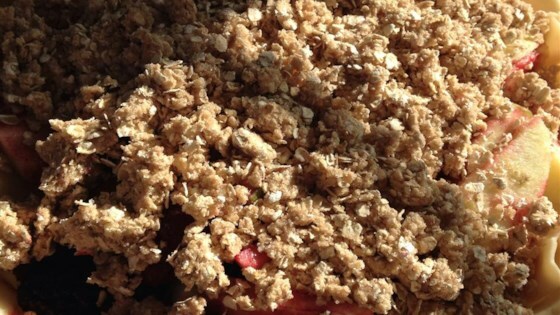 Watch how to make a crumbly topped apple pie. Very tasty! But only 2 cups of apples didn't fill my pie plate very well. Even a regular plate maybe needs more fruit. I'll definitely do this one again! Thanx Lindze! I added an extra cup of apples. I also added crushed up "Good Friends" Kashi cereal, and oats to the crumb topping. Delicious! I will definately bake again!